Due to the immigration of the Bantu people (refugees) caused by wars and erosion in savannah areas, the 50,000 Pygmies are forced to share Ituri forest with more than 2 million other people. The Pygmies do not take part in the money economy and survive by bartering their labour, firewood and game in exchange for the bare necessities of life. Their traditional way of life has been much disturbed in the last decade. 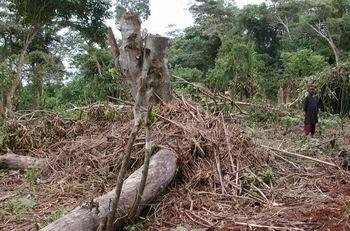 Commercial plantations are cutting deeper and deeper into the diminishing rainforest, restricting and reducing the food supply for the Pygmies. 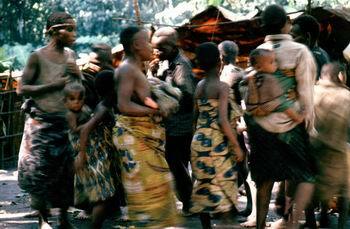 They often have to depend on the surrounding Bantu peoples for whom they work on the plantations in exchange for food. Infectious diseases unwittingly brought by the Europeans or transferred from the Bantus are taking their toll amongst the pygmies: in a typical community about 20% of the population is ill. They suffer particularly from malaria, eye diseases such as endemic river-blindness, intestinal worm diseases, framboesia, lung- and viral infections and from wounds which easily go septic in this tropical environment. Many children catch measles and suffer from polio and their mortality rate is very high. Adequate health care is expensive and local resources are extremely limited. The unique pygmy people need our support. With the help of the many friends of the pygmies around the globe we provide essential health-care and assistance in education and agriculture - but with more funds we could do so much more. A little money goes a very long way. For example, for only Euro 30, -- you can send a pygmy child to school for a whole year. We can pay the teacher and provide educational materials and medical care for the pupil. We need your support.